Apologies in advance, because this makes no sense even to me. Imagine a squid sitting on top of a very big fish. Bear this image in mind, because Ill come back to it later. I wish I could say that I saw this in a dream and just had to post it, because that would at least have given me some kind of excuse. Anyway  what this idea relies on is pumping some kind of liquid into various hollow structures under great pressure, so that forms that were loose and flexible suddenly become absolutely rigid and stronger than iron. No sniggering at the back there. Now, helicopters are often compared to dragonflies and the like, but Ive always thought that their main structure can be easily thought of in fishy terms. Eyes=cockpit, lateral fins=those wee stubby wing-like things that Airwolf had, tail=well, tail. Ive been scouring Google Images for the perfect fish type to illustrate this theory, but its proving hard to find. The Angler fish has the required bulbosity at the head end to accommodate a fairly spacious cockpit, but the further aft you go the less aerodynamic it gets. Sticklebacks have a better tail, but the front end is a bit too two-dimensional for my purposes. So  make a helicopter that looks like a fish. Clever engineers could even design a suitably camouflaged tail rotor that looks like a barnacle when its spinning at full thwup. So far, so good. Now, here comes the squid. And Im guessing youre probably slightly ahead of me already. The head of the squid is there for purely aesthetic effect, but its long, pink tentacles currently draped over the body of the fish are the real business end of this contraption. Start the fish up, and those loose and lazy tentacles suddenly start to stiffen as the magic liquid Ive yet to invent is forced into them: they start to rotate, slowly at first, but soon theyre a pink suckery blur as they flash round and round above the fishs glassy-eyed head. And then its up, up and away, swimming through the clouds as if the sky were sea. But whats the point? An airline passenger glances out of the window and decides hed probably best not order another drink from the stewardess. Frolicking far from home, a lone dolphin flips from the water and gets a new story to tell his mates that theyll never believe. But, far out across the ocean, the pilot of the Fishicopter points the nose of his craft downward, and suddenly cuts the engine. Immediately, the pressures that held everything rigid drop, and, as the copter meets the water, the rotors are now like strips of ribbon billowing behind it. As well as the rotors deflating, rigid spars in the tail and the stubby fins suddenly also become flexible, and a complex series of motors give the sub-aqua-aeronaut full control over his newly underwater vehicle. With a flick of its tail and a horrendously drag-inducing waggle of flaccid tentacles, the Fishicopter takes to this new medium like  well, like youd expect. When the time comes, a mighty rush to the surface and a timely press of the ignition button will cause a Shamu-type jump to turn into another (slightly soggy) helicopter flight. Sperm whale zepplins are truly a whole other subject, Briz. Believe me, you don't want to get me started. So just after the 'copter hits the water - who pilots it? Since the original guy has just died of a shattered spine. Sorry - not being too clear in my description. Helicopters are quite good at hovering, so I envisaged more of a gentle kiss with the ocean rather than a spine-jarring splashdown. Well, which is it? The photos or your drawing or what? 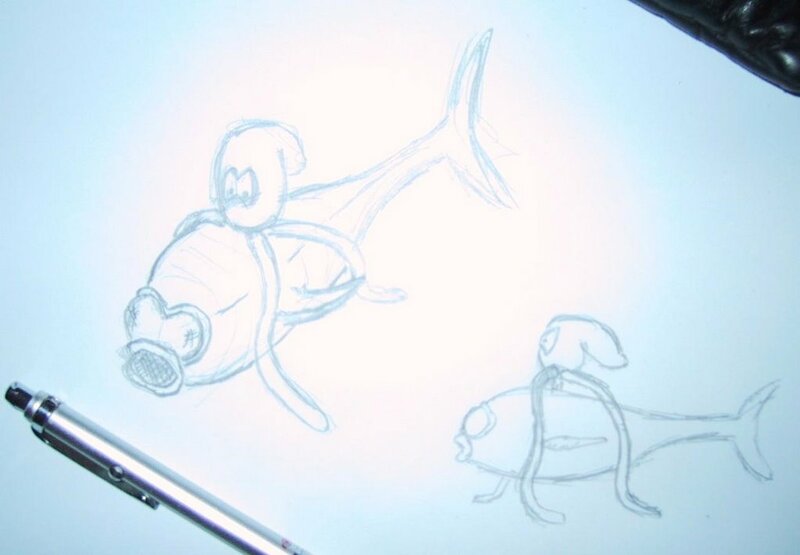 And, in your drawing, it appears that there's a symbiotic second fish atop the first, yes? A combination of all three. I'm not very good at drawing squid. I knew I should have drawn a blurry sketch of the squid with all tentacles a-spinning. Helicopters already have floppy rotor blades--they are stiffened-up by centrifugal force. If you put pressurized liquid into a long, skinny sack and then spin it up, you are going have some incredible outward forces. I'll give you a croissant just on the chance that I could ever watch this being tried. Sounds like something Spongebob Squarepants would use. Of course, there should be luminous bits running along the edges of each rotor blade/tentacle. Many helicopters have floppy blades but some are rigid rotor such as the BO105 and others. (Yes, [texticle], I do happen to know rotorcraft very well). That would be my assumption. I've been fooled before though. What's is this device made of? Why is this device made of? I wish I could answer those penetrating questions, jelly. I wish I knew. I heard there were a lot of fish in the Melbourne Commonwealth Games opening ceremony, and someone mentioned helicopters as well. Obviously, helicopters look a lot like fish, and a squid would make a natural rotor, so... Aw, hell. There's no excusing it. Who am I trying to kid. Now where did I put that box of frogs? I suppose a buncopter would get boned here.